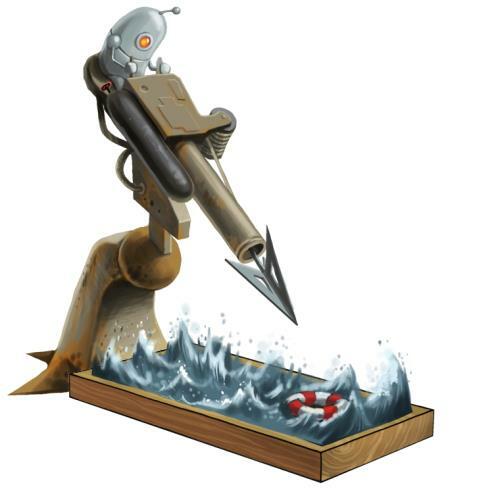 The Harpoon Gun is a Hydro type weapon. Firing an oversized 200 pound spiked projectile makes for an extremely intimidating trap. The Harpoon Gun can be purchased for 664,500 gold from the S.S. Huntington IV Trapsmith. It refunds for 119,600 gold at the same location. The Harpoon Gun, if smashed, can be reassembled from Launcher Parts. Because the Net Cannon can be purchased for 664,000 gold (a 500 gold discount on the price of the Harpoon Gun), the following crafting formula can be used to create the Harpoon Gun for 500 gold less that the purchase price through the Trapsmith. Net Cannon – Additional source of Launcher Parts for recrafting the Net Cannon. Smashing this weapon with the Hunter's Hammer yields the Launcher Parts.